Please note: this is the 2004 re-issued version from The LA Underground. Our current inventory was personally supplied to us by One Be Lo and Senim Silla, from copies of the CD turned over to them when The LA Underground's contract expired. These copies are not shrink wrap, and a hold is punched in the bar code on the back. The release now truly belongs to the artists' own label, even though the copies we have were pressed by somebody else. All tracks produced by Trackezoids. Except Track 6, Produced by Senim Silla. I can't believe I somehow slept on these cats until last year! This album was literally music to my ears the first time I heard it. It's as if you can taste the sweat and passion that went into this record! Hands down, this instantly became one of the greatest albums in my collection among hundreds. Usually you just don't get hip-hop that sounds this raw and original. One.Be.Lo aka OneManArmy is an amazing lyricist and I would have to place him among my top ten favorite emcees today. His intelligence shines on the mic through his thought provoking lyricism. His brutal honesty and disregard for the high amount of egotistical and often times non-genuine conformist lyricism (we hear too much of in hip-hop) is undeniable, and proves powerful by touching the listener on a deeper level than we as listeners have come to expect. With Decompoze seemingly out of the picture, it looks like this will be the only Binary Star album that will go down in the history, and it will undoubtedly do just that! 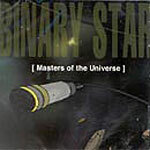 Binary Star is an underground duo from Pontiac, Michigan. These two emcees (Senim Silla and OneManArmy [aka OneBeLo]) recorded their debut entitled "Water World" in 1999 on $500 budget, released on their own label, Terrorist Records. They only pressed 1,000 copies of the record. So you would have been pretty lucky to get a hold of one. The original mixes and songs on "Water World" were later re-mixed and rearranged for this album, "Masters Of The Universe". Senim Silla and four others were charged with murder in January of 2005. All were acquitted except for Silla, who escaped from police custody during transport from jail to court. He is still a fugitive on the loose to this day. Needless to say, OneManArmy and Senim Silla no longer record or play shows as Binary Star (since 2000). Well, lucky for us, these two emcees managed to make one of the greatest hip-hop records ever recorded. Another one of my favorite hip-hop records, OneBeLo's (aka OneManArmy's) "S.O.N.O.G.R.A.M." was the reason for my purchase. Binary Star, like OneBeLo's record, focuses on lyrics for the most part. They have a message to all of the P.Diddy's and Chingy's out there. They don't brag about their cars, money, clothes or any other mundane material items; and they make it a point to let you know this. Their lyrics are simply unmatched by any underground hip-hop artist/group. In fact, of all the underground hip-hop I've heard, this one is truly unique. Their flows (even those brought forth by Decompoze) are impenetrable. They come up with what seems like the best written rhymes that you can think of. But in all actuality, almost all of these verses were dropped and recorded in one take (which makes it more amazing). Although I've never heard "Water World", I would say the production on the album is pretty dope, and original. It's no El-Producto, but it showcases their wicked flows and rhymes nicely. "Masters Of The Universe" was released on Subterraneous Records (OneBeLo's label) in 2000, and includes appearances by Decompoze, DJ Phrikshun, DJ Upperkut, Elzhi, J.U.ICE, AML, O Type Star, Lacks, Ki and Brenda Jae. You may be confused if you own this album by looking at the track listing above (I know I am). My album has a much different track listing (and 24 tracks, as opposed to 17). From the first cut, "Reality Check", they let you know what time it is with some lyrics like this (from Silla) - "I ain't all about economy / so the fact that all these wack emcees is making G's don't bother me". This album will have that head nodding from the start. The second cut, "Conquistadors", is one of my favorites. OneManArmy shines here with some lyrics like this one - "Nobody's next to grab it / I got lyrics to Go-Go like Inspector Gadget / In a bad habit fiending for the potency / I'm the Narcotics Anonymous Dope Emcee". Here's another one from "Slang Blade" - "Senim's of the size of the kill with a slang blade / Some call it a kaiser / Equalizer blows your brains, expose your wiser". "Fellowship" is my current favorite, that features the extraordinary talent of Decompoze (who is just as talented as the company he shares). Aside from his mad lyrical precision, "Fellowship" also has one of the dopest beats on the record, with a sample that sounds like it could be from the old Batman TV show theme, and a driving funked up bass line. Another one of my favorites (also featuring Decompoze) is "Indy 500". This one has a clear message - "We need to try to keep this music to ourselves / We sellin' out this art for some money / to some guy who don't care nothin' about this music / We gotta keep it to ourselves.. tryin' to win the Indy 500". The chorus is even better for all you underground hip-hop heads - "All we need is beats, and rhymes and go and spark it / As long as we got the Underground, yo, we got a market / I don't need an agent to tell me how to run it / Cause my goal's to win the Indy 500". The album is just filled with intelligent lyrics that are simply astonishing. If you're into the underground, you probably complain that mainstream rappers rap about gold, bit**es, Bentley's, clothes, and other lame material possessions. Peep this lyric from "Binary Shuffle" - "Do you wanna hear a song about the money we got? (Oh No!) / Talk about the people we shot? (Oh No!) / Brag about the clothes that we wear? (Oh No!) / Do you think what we sayin' is fair? (Oh Yeah!)". As if I haven't praised this album enough, I will tell you that I've listened to this album at least 15 times since I got it less than a week ago, and I'm already ranking it in my top 10 best rap albums I've ever heard (which is a lot). These guys got it all; intelligent lyrics, intoxicating flows, and dope beats. I'm sure you've heard that about plenty of rap albums, but this one is on a higher level. You have to hear it yourself to witness the magic, because my brain and fingers are hurting from typing this long a$$ review. I got into One.Be.Lo and his solo albums before I checked out this one. I have to say I like this album better than either of his solo releases and I love both of those. This album is very good. I hope they do more together.